Mit einem herrlichen Blick über den Strand von Psarou genießt das Nissaki Boutique Hotel eine ideale Lage auf der Insel Mykonos. Es bietet Aussicht auf die Ägäis und ist nur einen kurzen Spaziergang vom Sandstrand Platis Gialos entfernt. Whether you're traveling individually, as a couple or in a group, your ground transport needs are covered by this private airport transport service from your Mykonos island hotel to the cruise port or Mykonos Island National Airport. When your vacation is over, simply meet your driver at your Chora, Gialos Platis, Ornos or Paradise beach resort hotel at a prearranged time. Then, settle into your comfortable, air-conditioned vehicle and head straight to the airport or cruise port. To make a booking, simply note your flight or cruise ship details and your Mykonos hotel accommodation details. Your transfer will be confirmed instantaneously and you will be provided with a travel voucher to present to the driver. Approximately 24 - 48 hours prior to your departure from Mykonos, you will be required to reconfirm exact pickup time and place (the contact number will be provided on your travel voucher). Price is per person, based on three adults per vehicle. Whether you're traveling individually, as a couple or in a group, your ground transport needs are covered by this shared airport transport service from your Mykonos hotel to either the cruise port or Mykonos Island National Airport. When your vacation on the Greek island is over, simply meet your driver at your Chora, Gialos Platis, Ornos or Paradise beach resort hotel at a prearranged time. Then, settle into your comfortable, air-conditioned shuttle vehicle to travel to the airport or cruise port. Start your Mykonos vacation with ease by booking this private arrival transfer from Mykonos Island National Airport or the cruise port to your Mykonos hotel. Your friendly and professional driver will greet you upon your arrival and drive you directly to your hotel in the comfort of a private, air-conditioned vehicle. It's that easy! Start your Mykonos vacation with ease by booking this shared arrival transfer from Mykonos Island National Airport or the cruise port to your island hotel. Simply select a time to suit your schedule, and then meet your friendly and professional driver to travel to your destination by air-conditioned shuttle vehicle. It's that easy! Uncover the archeological drama of Delos on a half-day tour from Mykonos! With an expert local guide, cruise over the sea to the UNESCO-listed sacred island, and explore its main excavation site on a walking tour. Hear all about the island in the days of Ancient Greece, and admire highlights of the excavations including the Terrace of the Lions, House of Dionysus, Archeological Museum of Delos and more. 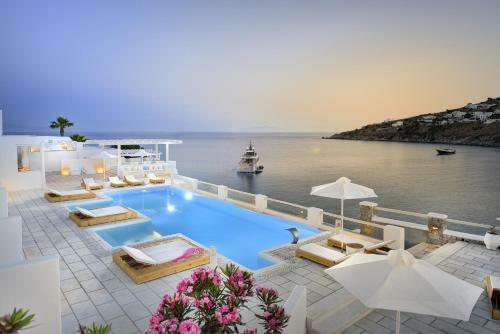 An upgrade is also available to include hotel pickup and drop-off from Mykonos hotels.